Alaska Native Villages suffer from some of the worst poverty in this country. 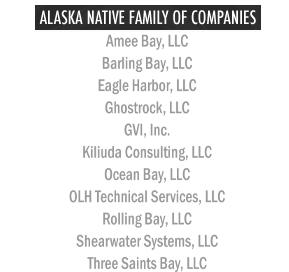 In an effort to improve these economies, Congress has given Alaska Native Corporations (ANCs) unique rights in the Federal procurement process. These rights provide the Federal agencies and government contractors with strong incentives to contract with ANC firms. Below are some examples of how doing business with any subsidiary of Three Saints Bay, LLC can benefit you. Department of Defense (DoD) Indian Subcontracting Program, "The Native American Incentive Act", provides an incentive to DoD prime contractors who use Indian organizations and Indian-owned economic enterprises as subcontractors. If an RFP includes Clause 52.226-1, entitled "Utilization of Indian Organizations and Indian-Owned Economic Enterprises," the program provides for an incentive payment equal to 5% of the amount subcontracted to the Indian organization or Indian-owned economic enterprise.